This disc has been a revelation to me and I regret missing it on its Virgin issue ten years ago; it has now been re-issued in the EMI British Composers series at mid-price. 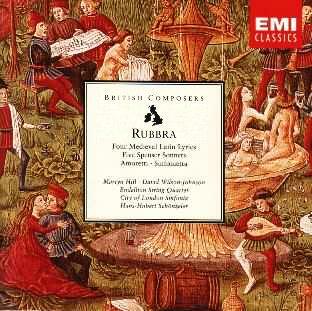 Edmund Rubbra has a following who regard him as the greatest English symphonist; others might place him as one of the greatest , but I am probably inviting an avalanche of e-mail when I say that I have always struggled with his music. I will attempt to fend off that e-mail by declaring that I really have been persistent and have bought a number of CDs over the years, including this one which did not arrive as a review copy, and have listened to most of the 11 symphonies. My problem with Rubbras music is that although he has interesting ideas, I find he does not develop them in a way that sustains my interest. He seems to lose direction, seemingly meandering without purpose, quite unlike Arnold and Alwyn who were contemporaries, all three having been born in Northampton I purchased this disc in the hope that I might find Rubbra more persuasive as a composer of pieces on a smaller scale and that is exactly what we have here. The disc contains three groups of songs and is completed with the Sinfonietta for large string orchestra. This was a late work (Opus 163 composed in 1986  the year of his death) but was his first piece for a string orchestra. Hans-Hubert Schönzeler, the conductor on this disc, states that Rubbra told him he wanted to compete in the tradition set by Elgar (Inroduction and Allegro & Serenade), Vaughan Williams (Tallis variations etc. ), Holst (St Pauls suite) and Britten (Frank Bridge variations, simple symphony etc.). The Sinfonietta was first performed by the Albany Symphony Orchestra who had wished to commission a work and accepted this one in progress. The two sections, Andante con moto ma non flessibile and Lento run contiguously through a held bass line. As with the Vaughan Williams Tallis variations, this work sounds as if the composer had in mind a cathedral acoustic rather than the concert hall, and indeed, the slow sonorous opening is reminiscent of the opening of Dives and Lazarus (without the harp). This music is powerful yet reflective  even sorrowful. A most valuable fill-up lasting 15 minutes. Two of the song cyles are settings for tenor of sonnets by the 16th Century English poet Edmund Spencer. The Five Spencer Sonnets Opus 42 (1935) were first performed by a soprano and string quartet but was reworked for tenor and string orchestra. The second cycle, Amoretti Opus 43 (1936) was written for tenor and string quartet but Schönzeler received verbal authority to arrange the work for string orchestra as heard on this disc. Being Sonnets they are full of sighing, sorrows and pining for lost love but the settings are beautiful and enthralling with Martyn Hill (tenor) slightly forwardly balanced against the string orchestra. Some of the perkier movements (the second of the five Spenser sonnets for example) do sound like Britten and Martyn Hill then reminds me of Peter Pears way with English song. Many of these songs will have me coming back repeatedly because of their beauty. If you have the opportunity to audition this disc listen to Shall I then silent be or shall I speak? or the wistfullness of Lacking my love I go from place to place. The Four Medieval Latin Lyrics for Baritone (David Wilson-Johnson) are more traditional, reflecting English folk-song which I do not detect in the Spenser cycles. The opening song is rumbustuous. Summer is coming and with it the love of a young maiden. The second is more plaintive as Summer is slowly passing away and the love was unrequited. The third has maidens dancing in the Spingtime and is reminiscent of some of the songs in Orffs Carmina Burana. The fourth and final song in this cycle is a powerfully affecting lament Could I share thy grave with thee? Happy then my death would be.